After researching which cities to visit on our short, one-week stay in Peru, Ryan and I started dreaming about the food. We started by watching Anthony Bourdain’s No Reservations and his newly released Parts Unknown for a quirky chef’s take on the country’s delicacies. The episodes opened our eyes to the new foods we will be able to try and got me researching what we can eat and where we can find it. 1. 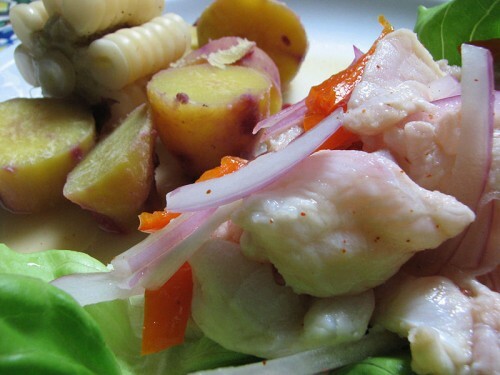 Ceviche (or cebiche) – chunks of raw seafood marinated in citrus, often including onions and aji peppers. There’s a variation called tiradito where the fish is kept in strips and no onions are included. I plan on trying both during our time in Lima, Peru’s coastal capital (see picture below, from wikipedia). 2. Cuy (Guinea Pig) and alpaca – I’m not sure if I’ll try the cuy, but I am looking forward to a dish with alpaca. Both are popular in Peru and many visitors seek out restaurants that serve these local delicacies. 3. Lomo saltado (“jumping beef”) – beef mixed with tomatoes, peppers, and onions, and seasoned with soy sauce. It is often served over rice. 4. Anticuchos – meat skewers often served as street food, but can also be found in restaurants. Traditionally, the skewers are made of beef heart. 5. 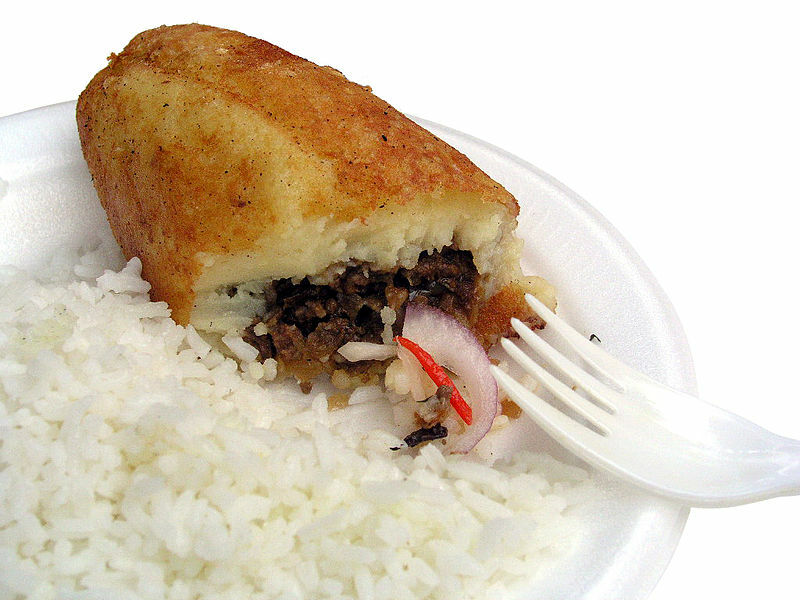 Papa rellena – mashed potatoes rolled into balls, stuffed with meat, and deep fried (see picture below, from wikipedia). 6. Rocoto relleno – spicy pepper stuffed with ground beed, onions, olives, and a hardboiled egg, topped with cheese. 7. Chifa (Chinese food) – the Asian influence in Peru is strong, and the Chinese food is said to be delicious. Lima even has its own Chinatown, which will be worth a visit for the best Chinese food in the country. 8. Pisco Sours – no trip to Peru can be complete without trying the country’s cocktail – a mixture of Pisco (grape brandy), citrus, sugar, egg whites, and Angostura bitters. I hear it goes down smoothly! 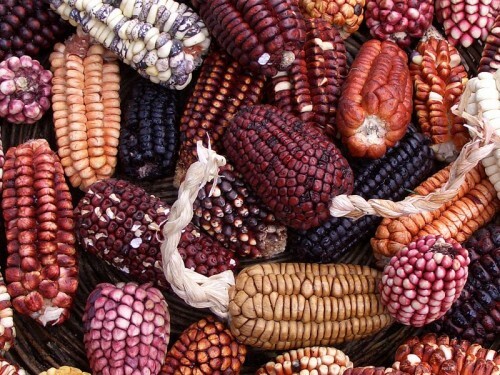 We are definitely looking forward to the culinary experiences in Peru. I don’t normally gravitate toward meat dishes, but reading about the flavors in these traditional foods is making my mouth water. I’ve also read about so many other dishes including Peruvian staples such as corn, potatoes, rice, quinoa, beans, and peppers. These dishes make up the food that Bourdain describes as “thrillingly different.” I’m ready to step outside my comfort zone and try the Peruvian cuisine! This entry was posted in Food, Travel and tagged food, Peru, Peru 2013 Trip, South America by Kristin. Bookmark the permalink.